KINGS FOR A DAY: Angus Illingworth with one of his kingfish caught off Barwon Heads. 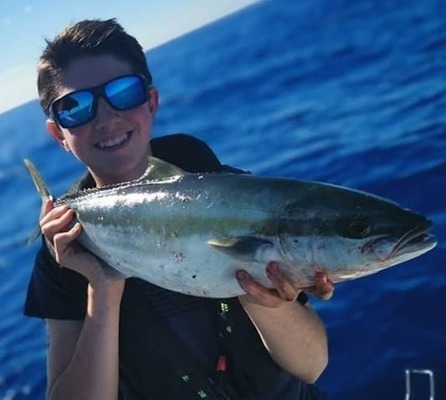 Angus Illingworth experienced a hot bite while fishing for kingfish off Barwon Heads during the past week. Using squid and knife jigs, Angus managed to boat numerous fish to around 70cm. The local whiting fishing was as good as ever, with Queenscliff producing quality bags. Fishing the sand holes between the weed during a moving tide was popular, with baits like pippie and squid being ideal. The snapper continued to bite over the Alcoa spoil grounds in Corio Bay, although some reports suggested the fish had spread out a bit wider and could be caught closer to the channel. Drifting over the spoil while casting plastics is a proven producer, while anglers fishing baits did well with pilchards, which also accounted for a number of small gummy sharks and flathead as by-catch. The little bit of rain over the past week triggered a good freshwater bite, with a number of waterways starting to fire up. Justin Rayner fished for redfin at Wurdi Buloc Reservoir and was rewarded for his efforts with a handful of healthy fish to 40cm. Casting metal spoons like the Norries Wasabi allowed him to reach beyond the weed and into the deeper water, which is quite low at the moment. Other anglers fishing Wurdi Boluc caught trout to 1kg on mudeyes. Lake Bullen Merri was productive again for Chinook salmon and trout. Fishing deep water with pilchard fillets just off the bottom worked, while trolling lures like the Rapala F7 in white or the Spotted Dog colours should do well especially when combined with a downrigger. Lake Purrumbete remained the place to be for those after a feed of redfin. They are always in huge numbers but lately we’ve seen some bigger-than-average fish caught on worms or grub soft plastics dropped deep into the schools once located, typically along the outside of the weed beds along the east side of the lake. Trelly’s Geelong’s Chris Pitman and friend Reece Pit fished the Glenelg River at Nelson over the long weekend, which coincided with the manual opening of the river mouth. They caught mulloway, estuary perch and bream while casting lures at the front of the river system in the area known as The Poles. The pair reported that fishing above the bridge was tough but water closer to the river mouth held a lot more action, with most of their catch falling to the Strike Pro Cyber Vibe 35.